Senior level U.S. officials have been claiming for many months now that war with China (probably in the South China Sea) is eventually inevitable. There are so many flash points that could kick off such a globally destabilizing conflict. For starters, you have the United States' long term support of Taiwan, the de facto Asian nation across the Straits of Taiwan which the mainland considers a renegade, breakaway province and part of its core territorial integrity. These are irreconcilable positions on Taiwan. There are also island group disputes between China and most the critical U.S. post-Second World War ally Japan. Potential political problems are similarly brewing with long time British colony turned Chinese vassal Hong Kong. A trade war could break out any month between the U.S. and Beijing over steel tariffs and trade imbalances. Most recently, another old conflict with China has re-emerged to trouble global stability and prosperity. This is the old territorial waters dispute between Beijing and Manila. Philippine President Duterte refuses to back down from the oil exploration and drilling drive in waters that China considers to be a part of its historically South China Sea pond. This past week, Duterte revealed that China had employed the word “war” in its discussions with him on the issue in the all too recent past. This is all part of why gold still glitters for many world leaders. IRA-approved gold is currently readily available now before any potential wider conflict breaks out. 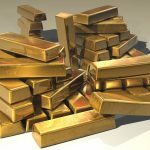 Time to look into the Top 5 gold coins for investors while you still can. The latest conflagration began brewing three years ago. The Philippines filed a dispute with the World Trade Court in the Hague, Netherlands in 2014. The court ruled two years ago in favor of the Philippines on the matter of the rights of Manila over its territorial waters in which the undersea mountain full of oil and natural gas lies. To the credit of the Filipino President Duterte, he waited more than two years after the international court ruling to restart drilling operations underwater. Now Duterte feels like the time is right to resume the exploration for energy in the midst of the South China Sea, one of the most tense bodies of water in the world. Back in 2014, the country suspended its gas and oil operations drilling in the Reed Bank, which lies in these international waters as you can see on the map below. They had waited for the ruling from the court in the Hague regarding China's aggressive territorial expansion throughout the South China Sea. Yet now this drilling activity is likely to renew before the end of 2017, according to the Philipines' Department of Energy Resources Development Bureau Director Ismael Ocampo last Wednesday. More than 20 individual oil, coal, and gas blocks on the Reed Bank and in nearby Palawan and the Sulu Sea may be auctioned off in a December round of corporate bidding, he claimed. These mountainous undersea regions are theorized to contain major gas and oil deposits. Even though The Hague tribunal affirmed the Philippines rights to develop the offshore gas and oil fields throughout its 200 mile long Exclusive Economic Zone (including the Reed Bank), China rejected such a verdict. Earlier in 2017, Philippines President insisted that China's President Xi Jinping had threatened him with war if the country tried to drill in the contested South China Sea. This choice to re-energize the abandoned drilling process there demonstrates how insecure Manila is regarding its own precarious domestic energy situation. The South China Sea Malampaya natural gas field has begun winding down. This makes the Philippines desperate to find a replacement to keep the proverbial lights on back home. “We intend to drill oil there, if its yours, well, that's your view, but my view is, I can drill the oil, if there is some inside the bowels of the earth because it is ours. The big gamble of the Philippines is whether the Chinese President will seriously make good on his threat to go to war over the Reed Bank and surrounding oil and gas rich waters which lie only 85 nautical miles from the Philippines' coast. China is still smarting from having received the international court's rebuke to its long-cherished Nine-dash line claim on its maps. This provides it with the intellectual basis for claiming sovereignty over the vast majority of the entire South China Sea. While war in the South China Sea between the vastly militarily inferior Philippines and rising military superpower China would be indeed tragic for the people of the Philippines, it hardly directly threatens you personally. The reason that this is a critically important issue for all Americas is because of the little known treaty obligation of the United States to defend the Philippines in the event of an assault on either its territorial integrity or its armed forces operating in the South China Sea. The Filipino Foreign Minister was quick to remind the world of this when threatened by the Asian Goliath China. Not only is there the long-standing defense treaty the U.S. has with Manila, but only three years ago the Philippines and United States expanded this arrangement with their ten year signed Enhanced Defense Cooperation Agreement. This military deal permits the American forces to have broader access to bases in the Philippines for stationing and positioning soldiers and equipment, aircraft, and war ships to effectively provide stronger and more comprehensive maritime security to the long-time allied Asian country. Former President Barack Obama called this arrangement a proof of the “ironclad” American pledge to defend its longest-lasting ally in Southeast Asia. The “Trump card” the Philippines is ultimately relying on is the commitment of American military forces to aggressively defend the Philippine territory, armed forces, and rights in the South China Sea in the event of an actual war breaking out with mighty Asian military powerhouse China. There is no question in any military analysts' minds that the United States can still easily defeat the Chinese by air or by sea. On land there is also no contest though, as the Chinese militarily numerically superior force backed by myriads of tanks and artillery means that no one can successfully take on the Chinese in a land war in Asia. Meanwhile, if it really comes to blows and the United States is forced to start sinking Chinese ships and submarines, and shooting down Chinese warplanes over the South China Sea, you can be sure the real collateral damage will be the world's trade and economy. Gold prices would soar on the outbreak of a war that would likely engulf not only China, North Korea, and the Philippines, but potentially also Taiwan, Japan, South Korea, and even Vietnam, all of whom have many grievances against China and no affection for Beijing. Gold outperforms traditional asset classes during market crisis periods. This is why gold makes sense in an IRA. Once the missiles start flying, the price of gold will be too high to countenance, if you can even find any available.